One way to prevent thieves from stealing your car is by locking the steering wheel. There are two ways to mechanically interlock your steering wheel: One is by using the inbuilt steering lock system and the other, buying a device that can be attached to the wheel to lock it. How does the first one work? In the ignition switch there is a mechanism that pushes a steel pin to nestle it into the steering column, like a deadbolt would do. At times, though, you may slightly move your steering wheel while you get hold of it to help you to get out of your car and inadvertently action the interlocking mechanism. So how do you now unlock your locked steering wheel? Because of the locking system the key will not turn now. You first will have to move slightly the wheel in the direction that it allows you to and, while you turn it, turn the key to the on position. This will cause the pin to retract back to the tumbler, thus freeing the steering column so that you can drive away. A piece of advice, be gentle when you turn the key. The last thing you want is to break the key off inside the lock. That would be a problem! Neither should you try to unlock it by forcing the wheel or using some tool to force it. If you do so, you will end up breaking the whole steering mechanism. If that has already happened to you, check out our Car Key Extraction services at 7 Day Locksmith. Do You Know The Club? 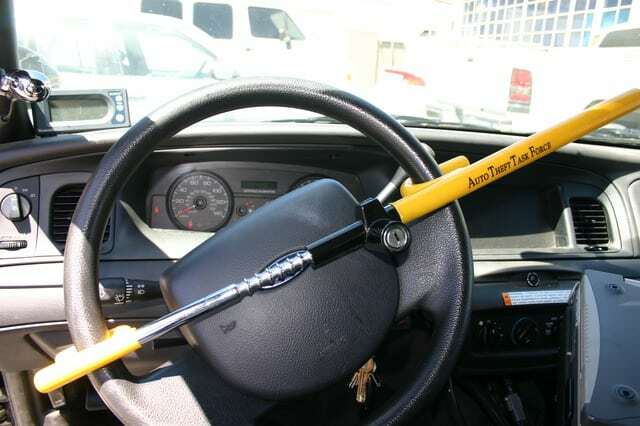 In contrast with the build-in steering wheel lock San Diego system, there are other means to lock the wheel that are not built in it. This is one of those incredibly simple but practical inventions that come and go in time. But, back to the subject, The Club is the common ancestor of all the steering wheel locks that exist today. It was designed by James E. Winner Jr., who got the idea in the Korean war, where he was instructed to lock the steering wheel of the vehicles with a metal chain. As we said, its design is incredibly simple but efficient. It consists of a hardened steel bar that is attached to the steering wheel and to the brake pedal, preventing both steering and braking. 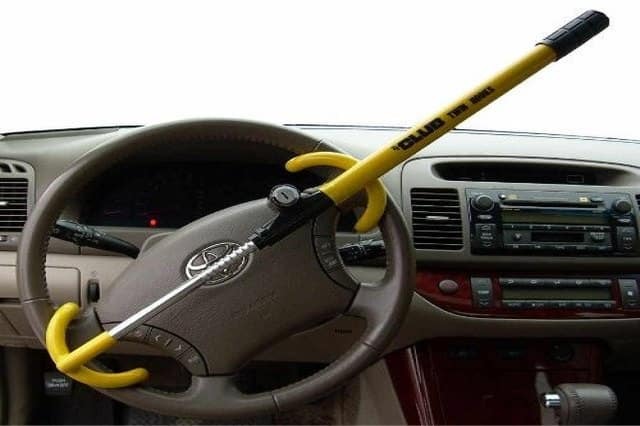 It is a rather rudimentary but effective steering wheel lock. From that idea many different ones stemmed. Some are made of two pieces that interlock and have two hooks at the ends that are meant to fit around the ring of the wheel. Once you have the steering wheel locked, the larger piece sticks out and it makes it almost impossible to turn the car. It all seemed like a pretty good idea until thieves found a way round it: cutting part of the rim off the steering wheel with a hacksaw which allows the club to be removed. 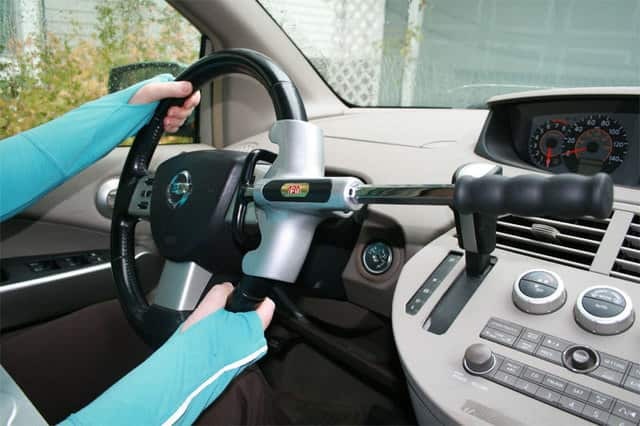 Then, bad news is that, not only can they operate the steering wheel, but they can now use the locking bar as a tool to force the steering wheel internal lock. These devices are great deterrents to ward off car theft. The Police argues that using one is the best way to stop high-tech thieves who nowadays have sussed out how to clone your car key in just a few seconds and bypass your vehicle’s computer. Many cars in a wealthy area of the UK were being stolen, so the police sent letters to the owners urging them to go back to steering wheel locks. Of course, this kind of device sends a clear message to the thief. It doesn’t say “you can’t break me”, it rather says “that other car would be easier for you to steal than me”. Since you want it to shout, as it were, this message to the thief, it is recommendable to have a look at one that has bright colours, so it can be easily spotted by the thief. Wrap type: This kind is many people’s favourite. It looks like a big butterfly sitting in the middle of the steering wheel and wrapping its wings around it. On one side it has a part that protrudes and makes it impossible to turn the wheel. Were you to brake it, you would have to saw through the metal, which would need a power tool and would make a lot of noise. Club type: In this category fit all the locks that copy the functional design of the club. Unlike the club, though, not all include a brake pedal lock. Most of them are longer or stronger versions of the original to fit bigger sized cars like pickup trucks or SUV’s. Maybe you are not wanting to buy a new lock. Do you have your steering wheel locked San Diego and need somebody to unlock it? If you surf the internet you will see different ways to unlock a locked steering wheel but not all are recommendable. In some pages you will find some tips to force the lock with a screwdriver or even how to freeze the lock with Freon gas. Do these methods work? No. And usually they will end up damaging your steering wheel, your front wind shield or could even cause your airbag to deploy (which is by no means cheap to fix). Using Freon gas is really dangerous too because you could get your finger frozen. In conclusion: Don’t use screwdrivers nor Freon Gas. What you need is a highly-trained professional locksmith that can unfasten the Club or even the steering wheel lock. And that is precisely what we can offer you at Locksmith San Diego. Our technicians have been extensively trained so that they can offer you the service you need. We have mobile vans equipped with the latest technology that will swiftly drive to your location from the closest of our more than 67 shops. Do not hesitate, call us!